It is lovely when people recommend to you a book that they love, and I have especially enjoyed it when people want to do so after finding out about this challenge. At a rehearsal the other week I was chatting to Julia about The Book Challenge, and she was hearing about it for the first time. The next rehearsal she came up to me with this book saying that she wanted to lend me something for it so she searched her shelves for something she liked which wasn’t absolutely massive (I am on deadline you know). It felt very grateful that she had taken the time to find something for me, and having now read the book, am even more so. 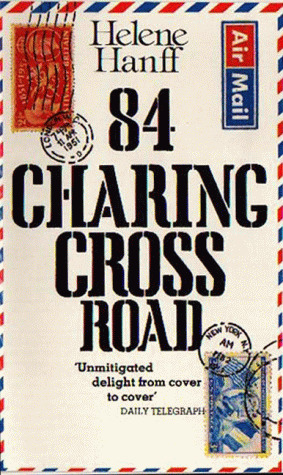 84 Charing Cross Road sums up quite perfectly the definition of a charming book. It is written in the form of letters between New York based Helene Hanff and the staff of Marks and Co. – an independent bookshop specialising in out of print books – over a period of about twenty years, beginning just after the Second World War, and continuing until the late sixties. Without ever having met, a relationship grows between the American writer, and the occupants of the shop, who off the back of Hanff’s generous purchases of food packages to their rationed times, grow to see her as a friend rather than a client – particularly her main correspondent Frank Doel. With letters appearing from Frank’s wife Nora, and friends of Hanff’s who have visited London, you get a real sense of the characters of everyone, the esteem to which each of them holds one another, and the community feel they generate. And the big payoff – all of the letters are genuine. Hanff collected them together, and after gathering some consents, had them printed. Without having read it, it is impossible to realise just how affecting these letters become. At one point I genuinely cried a little (on a 96 from Bluewater no less) as you become truly entangled in their lives. However, upon getting halfway through the book I was holding, the story came to an abrupt end. It was then that I realised that this was not just one book, but a double edition of two Helene Hanff books in one. I was devastated. In a little over a hundred pages, I had become so attached to the lives of the people in the letters, that I didn’t want to read something else that she had written, I wanted more of the same, with the same people and the same ideas. So imagine my happiness when I started the second book to realise that it all started again where the last book had left off. After the publication of 84 Charing Cross Road Hanff was invited to London for the first time ever to promote the book, and she keeps a diary chronicling the meetings she has with the friends she made at the bookshop, and fans of hers in the UK who she is always happy to meet. The whole thing is such an uplifting happy book, and makes you feel good and warm that people have ever existed who think the way that some of the books characters do. Hanff’s writing style it witty and self deprecating, and truly lets you see through her eyes. I cannot recommend this book enough, so if you haven’t read it, then do yourself a massive favour and go and grab a copy now.